IN a big weekend of South Australian National Football League (SANFL) action, plenty of young stars stood up across the three levels of competition, as Norwood remains undefeated on top of the table, while South Adelaide is just a point behind after forced to split the points with a plucky Glenelg outfit in a draw in Round 3. Norwood’s League side snuck home in a poor kicking game over Sturt by five points. Ed Smart kicked three goals in the win, and key mid Matthew Panos was among the best. 2019 draft talent Dylan Stephens played his second league game and was solid again finishing with 15 disposals. Cole Gerloff was once again good for the Redlegs, earning a Powerade Breakthrough Player nomination for his efforts. The Reserves saw another 2019 talent in Cameron Taheny best on ground with 24 disposals and a goal in an all round game. Sturt ball magnet, Adam Trenorden and youngster, Casey Voss were among Sturt’s best. In the U18s, Sturt’s Declan Fahey backed up his good form to date with a 32-disposal game and a Torrens Uni Most Valuable Player nomination, while Mani Liddy was also busy with 31 touches, 11 rebounds and four inside 50s. For Norwood, Mitchell Carroll was busy with 30 disposals and 11 clearances, while Xavier Tranfa had 22 and seven. South Adelaide will rue conceding a six-goal final term to the Tigers at ACH Group Stadium on Saturday afternoon in what was the first draw of 2019. Despite bagging nine majors against the Crows the previous week, Liam McBean was restricted to just one behind from 7 disposals. Fortunately, Lachlan Hosie (14 disposals and 4 goals) and former Magpie and Swan, Jesse White (15 touches and 2 goals) picked up the slack up in front of the big sticks. Carl Nicholson managed 29 disposals while youngster, Will Gould played perhaps his best senior game for the club, collecting 24 disposals, 10 marks, six tackles and seven rebound 50s. For the visiting Panthers, Samuel Overall booted three while Alex Cailotto and Liam Fitt kicked two apiece. Nic Schwarz (22 disposals, 8 tackles and a goal) and Abe Davis (28 disposals and 9 clearances) were prolific in the midfield, with the ever-reliable pair of Nick Liddle and Joel Cross, both having a big impact around stoppages. 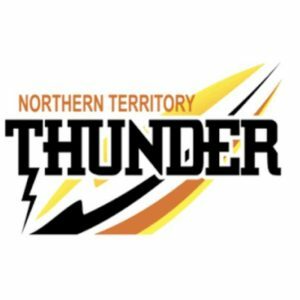 South snuck home in the Reserves, and it was a whole team contribution from the Panthers. Job Colwell was the highlight from the 2019 Panthers’ draft crop who were on show, while Declan Carmody continues to perform well for the Tigers. In the Under 18s the Eagles dominated Glenelg, seeing Joshua Morris add to his impressive goal tally so far this season with another five majors. Callum Park again was among Glenelg’s best. The Crows were too good for the Eagles on the weekend, packed full of a star-studded Adelaide lineup keen to impress selectors to break into the AFL side. Eagle, Cooper Gaffney made his league debut after a strong season so far. Bryce Gibbs played his first SANFL game since being drafted and was among the best, along with Hugh Greenwood and Patrick Wilson. For the Eagles it was an impressive performance by young talent James Rowe, who booted five goals in a lone hand for the Eagles to stand out as a clear best, while midfielder Jordan Foote was solid as ever. This was an intriguing match, with the Eagles all over the Roosters in the first half, while a strong fight back in the second half gave the Roosters a sniff before the Eagles settled well into the win. There was some quality talent on display, to which recruiters had a keen eye on. Eagles’ Jackson Mead was again prolific in the midfield, while the experienced Jake Johansen, in his first game for the year, slotted four in a classy performance. Young Eagles forward, Jamie Coff is one to watch with another three goals, while Roosters big man Dyson Hilder showed some real signs against his bugger opponent. Ben Jarman was a standout for the Roosters all day. Port accounted for North in a tough matchup, with Power-listed Jack Trengove and Todd Marshall easily the best for the Magpies. Trengove has started the year impressively and will be close to selection for the Power line-up. Harrison Magor topped the charts for North Adelaide in the loss, collecting 23 disposals, 10 clearances six marks, six inside 50s and laying nine tackles, while for South Adelaide, Marcus Lippett (30 disposals, nine clearances, four inside 50s and five tackles) and Zachary Dumesny (23 disposals, nine marks and a goal) were also busy. Liam Hamilton slotted three goals from 22 disposals, five clearances and four inside 50s for hte Panthers. Centrals got their first win over the Bloods in a tight game. Former Carlton and Crows forward, Troy Menzel collected two goals and was solid for the Bulldogs. West Adelaide had debutant Patrick Fairlie this week, making a strong contribution and rewarded a well-deserved Powerade Breakthrough Player nomination for his performance. It was a tight win for Centrals in the U18s and good to see a performance from father-son Henry McCabe (son of Luke McCabe) in the best, along with consistent talent Corey Durdin. FOLLOWING Round 2 of the South Australian National Football League (SANFL) competition, our writers Jamie Morgan, David Chapman, Tom Wyman and Damon Mattiazzo recap some of the impressive performances across the weekend. Glenelg collected their first premiership points of the new season by defeating a young Adelaide side under Friday night lights at the bay. Former Richmond Tiger, Liam McBean was the hero for the home side, bagging nine majors from full-forward. He was well-supported by a half-backline comprising of skipper Chris Curran, who amassed 31 disposals and 17 marks, and former-Carlton player Aaron Joseph (24 disposals and six marks). Potential high draft pick Will Gould was solid in defence, collecting 19 touches and seven marks, whilst 2018 state-representative Finn Betterman managed eight disposals in just his second league appearance. For the Crows, Myles Poholke slotted three majors to stake his claim for a call-up and Cam Ellis-Yolmen continued to find the ball, racking up 36 disposals and 7 marks. Recent draftees, Lachlan Sholl (34 disposals, six marks and eight rebounds), Jordon Butts (19 disposals) and Ned McHenry (15 disposals, five marks and five tackles) were also impressive. Expect Hugh Greenwood (19 disposals and 10 clearances) and Jordan Gallucci (16 disposals) to return to the Crows senior onball rotation within weeks. Two of the three clashes between the Bulldogs and Redlegs were absolute thrillers, as the Redlegs claimed victory in the League clash by just three points, before Central District scored the points in a one-point victory over Norwood in the Reserves. All eyes were on potential first round pick, Dylan Stephens who cracked his way into a strong Norwood League side and looked the part, collecting 18 disposals, four marks, three tackles and booting a goal on debut. Lewis Johnston continued his ripping form with 38 disposals, four clearances and seven marks, while for the winners, Jarrod Schiller had 28 touches, eight marks, seven clearances and a goal. In the Reserves, Isaac Saywell had a team-high 29 touches as well as four marks and four clearances for Norwood, while Cameron Taheny was lively up forward, booting three goals from 14 disposals and nine marks (three contested). For Central District, Steve Burton recorded 34 disposals and 13 clearances in a midfield masterclass. At Under 18s level, Henry Nelligan was impressive for Norwood, racking up 28 disposals, 10 clearances, five marks, six tackles and booting two goals in the win, while Xavier Tranfa finished with 26 touches, three marks, four clearances and seven tackles. For the Bulldogs, Rhys Cannizzaro was the one to watch, racking up nine clearances and laying 10 tackles from 27 disposals and five marks. In the Reserves match, North big man Dyson Hilder started off in a midfield role and after half-time switched to key defender on the dangerous Westies forward. In the Under 18s, North got the win against Westies, led by Harrison Magor with 33 disposals including six clearances, while Charlie Dowling kicked four goals from his 18 possessions and eight marks. For Westies, Bailey Chamberlain had 28 possession and 13 marks to be in his side’s best. In the League clash, North Adelaide ran out 29-point winners as Aidan Tropiano racked up 32 disposals, two marks, six tackles and nine clearances, while Max Thring booted three goals from 30 touches and four marks. For West Adelaide, Christopher Schmidt had a team-high 31 disposals and eight clearances, while John Noble booted three goals from 27 touches and Kaine Stevens finished with 30 disposals and a goal. 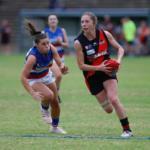 South Adelaide continued its fine start to the season with a dominant 36 point win against Port at Alberton Oval. South were led by co-captain Joel Cross who contributed 24 disposals and two goals, while former Eagle Tom Whittlesea made a big impact with five goals for his side. For Port Adelaide, Jack Trengove backed up his 44-disposal game from the opening round with another 42 touches for his side and could be rewarded with a call-up to the AFL side. Matthew Broadbent had 28 touches as he continues to stake his claim for a recall, while Category B rookie Kai Pudney continues to find plenty of the ball with 30 disposals coming from the wing. New Mapgies captain Cam Sutcliffe, and Aidyn Johnson both missed majority of the game with hamstring and concussion problems respectively. 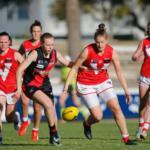 South took on Glenelg in Under 18s and went down in a five-point game. Glenelg’s Clayton Symonds (son of Tony) finished with a game high three goals while Sam Liambis led possession count with 24 disposals and nine tackles. Big man Riley Holder backed up another solid game in the ruck. South’s talented Zac Dumesny showed he is in for a big year in a strong performance for the Panthers. In the Reserves, South Adelaide claimed a big win, but it was Glenelg’s Darcy Bailey dominating with 39 disposals, 10 marks, seven clearances, three tackles and a goal, while teammate Declan Carmody is a name to watch, racking up 24 disposals, six marks, four tackles and booting a goal. Key forward Daniel Sladojevic was strong for the Panthers, booting a goal from 15 disposals and five marks (one contested), while Cameron McGree had 28 hitouts from 17 disposals and booted two goals. The Under 18s talent at the Eagles disposed of Sturt easily by 40 points and that was with some players up into the Eagles Reserves side. Forward Josh Morris finished with six goals, and Harry Shoenberg played well again. The Eagles Reserves side hung on in a close tussle with young talent, Jackson Mead (son of Darren) again playing well finishing with two goals and 16 possessions, while young Ruckman Sam Michael showed he is up to the challenge against bigger bodies. Teammate Jamie Coff also impressed up forward snagging three goals. Sturt’s Jed McEntee found his feet along with Anzac Lochowiak who looked at ease against the strong Eagles side. 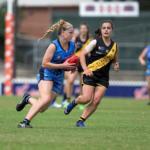 Sturt were victorious despite a late charge from the Eagles in the league game. Kysaiah Pickett kicked a goal in his League debut for the Eagles and Jordan Foote was a beast again in the midfield. Ex-Docker Danyle Pearce was also good for the Double Blues. ALL games for League, Reserves and Under 18s kicked off last weekend in a fantastic round of footy, with plenty of young talent on display. The feature matches for the round were the clashes between Eagles and North – in rematch after 2018 19th man saga, the clashes in all grades were bound to be fierce with no love lost between these clubs. The Eagles U18 side secured a 94 point win over North. It was a dominant display from the start with the highly fancied young Eagles side setting the game up with a seven-goal first quarter. Eagles player Harry Schoenberg completed an all round game with a goal and 17 out of 28 contested possessions, along with Josh Morris finishing with a big five goal haul. Lachlan McNeil is a player to watch in the midfield for the Eagles, doing well around the contest with 12 clearances. North struggled all day, but the clear highlight for the Roosters was impressive talent Harrison Magor, who held firm with 28 disposals and 13 clearances. In the tough hitout, Eagles took the victory by 25 points. The rematch had some heat and aggression from both sides, but the Eagles under new coach Sam Lonergan looked well drilled and an experienced side hard to beat at home. Ex-Sydney Swan Jordan Foote impressed in his League debut for the Eagles, and consistent performers James Boyd and Jack Hayes were among the best. North will no doubt bounce back, but having lost some young and also experience talent in 2018 draft will need to regroup. Port Adelaide kicked off its season with a comfortable 31-point victory over West Adelaide. Jack Trengove opened eyes with a whopping 44 disposals, seven marks, eight clearances, eight inside 50s, 11 tackles and one goal, while of the first year players, Boyd Woodcock found 20 disposals, four inside 50s and booted a goal, while Kai Pudney had five inside 50s and six marks from 24 disposals. For West Adelaide, Chris Schmidt and Murray Waite had team-high disposals of 24. Norwood took the honours at senior level against Glenelg, albeit in a tight five-point win at League level, and 19-point win in the Reserves. Will Gould was the talk of the town, with the potential top 10 draft pick racking up 24 disposals, three marks and 11 rebounds out of defence for the Tigers in the loss. Finn Betterman had 13 disposals and four rebounds, while the senior talent of the Redlegs showed out in the end with Lewis johnston and Mitch Grigg combining for 70 disposals, 23 marks, 11 clearances, 11 inside 50s and nine rebounds. The Reserves saw potential first round prospect, Dylan Stephens tear up the game with 35 disposals, 11 clearances, three marks, three inside 50s and two rebounds, while Isaac Saywell had 28 touches and six marks. The talented Cameron Taheny was solid with 15 disposals, nine marks, three inside 50s and one goal. At Under 18s level, Glenelg’s Callum Park racked up 32 disposals, 11 marks, five inside 50s, three clearances, three rebounds and three clearances, while Riley Hilder had a massive 12 clearances and 15 hitouts to go with 24 disposals, five marks and a goal. For the Redlegs, Henry Nelligan collected 34 disposals, eight marks, seven clearances, two inside 50s, four rebounds, 11 tackles and a goal. South Adelaide claimed a massive 107-point win in the Under 18s competition courtesy of six majors to Beau McCreery. Along with his six-goal haul, McCreery laid 11 tackles, had 21 disposals, took six marks (four contested, as well as seven inside 50sfor a massive 159 Dream Team points. Connor Sampson and Samuel Hindes also booted four goals to create havoc up the forward end, while Marcus Lippett finished with 29 disposals, six marks, seven clearances, 11 inside 50s, and two rebounds. Nicholas Kraemer was also a standout with 26 touches, eight marks, seven tackles, eight clearances, seven inside 50s. For the Eagles, Tyrone Milera had 24 touches, eight clearances and seven reounds, while bottom-age talent and last year’s National Under 16 Championships Most Valuable Player (MVP) Corey Durdin had 16 disposals, eight clearances and six inside 50s. 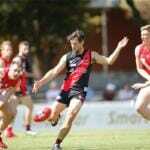 At senior level, South Adelaide claimed a 59-point win in the League, while Central District took home the points in a 34-point triumph at Reserves level. Overager, Hayden Sampson had 19 touches, three inside 50s and three tackles, while South Australian state represenative last year, Emmamuel Irra finished with a huge 27 disposals, four inside 50s and two rebounds. Adelaide proved too good for the Double Blues at League level, with Patrick Wilson and Andrew McPherson both impressing in the first game for 2019. Jordon Butts had 20 disposals and five rebounds playing out of defence, while Ned McHenry had 20 touches, three inside 50s, three rebounds and four tackles. Darcy Fogarty played in defence and had 10 rebounds to go with his 18 touches and six marks. For Sturt, Sam Colquhoun was the standout with 34 disposals, 11 marks and seven rebounds. 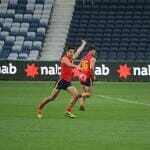 West Adelaide claimed the points in the Under 18 match over Sturt, as Will Day had a game-high 35 touches, 11 marks, five tackles, six rebounds, three inside 50s and two clearances. Jason Westley was also impressive for the Bloods, collecting 25 disposals, nine marks, four clearances, three inside 50s and five rebounds and a goal. For the Double Blues, Mani Liddy had 28 disposals, six clearances, eight inside 50s, six tackles and five marks, while Harry Weeks had 27 disposals, 14 marks and seven rebounds. In the Reserves, Sturt grabbed the win, as Anzac Lochowiak was impressive with 24 disposals, two marks, five clearances, nine tackles and a goal ,whiel Jed McEntee had 21 disposals, three marks, five clearances and nine tackles.